Spend Lent reading the Bible with friends! 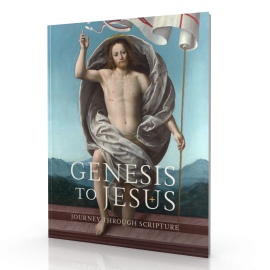 Sign up for free streaming of Genesis to Jesus and invite a small group of friends to watch with you. We know that the idea of hosting a Bible study and sharing the Gospel can be scary. But evangelizing to friends through reading the Bible is much easier than you might think. Hosting a Bible study can be a simple way to maximize your Lent. Us laity are being called to do more than ever in the unique times we face in the Church, and as overwhelming as the idea of hosting a Bible study might seem, it’s really the simplest way to share the Good News. Scott Hahn calls friendship the key to the New Evangelization, and at its heart, a Bible study is building friendships based on the Bible. It’s as simple as inviting friends and family over to share in the experiences of everyday life–from making a meal or having some drinks. Because the St. Paul Center is making it as easy as possible to share the Gospel and evangelize, all you have to do is host friends at your house. Our Executive Director Ken Baldwin shares that the Bible study that he and his wife host every Lent is the highlight of their week. Hosting a Bible study is an incredible and simple way to help you go deeper into the Word of God during Lent, while at the same time building deeper friendships. If you haven’t already, sign up for free streaming of Genesis to Jesus, and make sure to invite your friends. Get everything you need to confidently and effortlessly facilitate a small group study! The Leader Guide provides opening and closing prayers, introductions and conclusions, answers to review questions, reflections, and more.